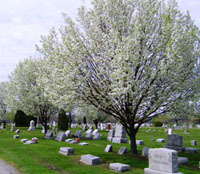 Sackett Cemetery is a perpetual care facility owned and maintained by Danbury Township. It is for the use of Township residents. The Township Fiscal Officer or Service Supervisor can provide you with details on lot costs and burial fees. Please call (419) 734-4091 for more information. Recycling service is located at 419 S. Bridge Road (SR 269 South) which is also the site of the Police Station. 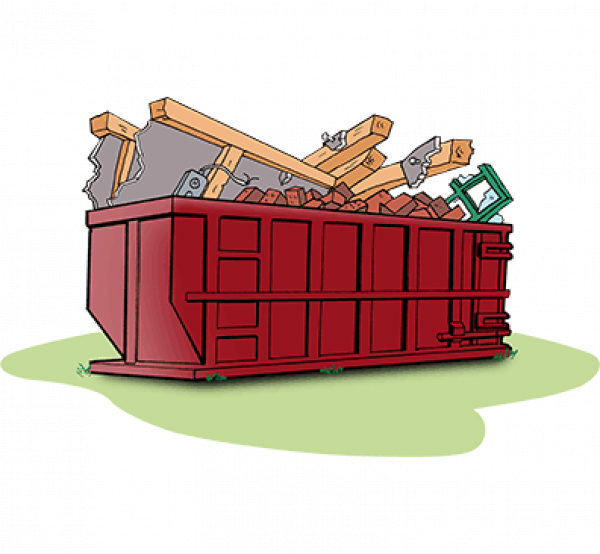 Bins are available available 7 days a week from dawn until dusk and are marked with a list of acceptable items. New recycling containers, more frequent pick-ups are now available. Residents pulling in the drive will see containers on the immediate right. This service is available 7 days a week during daylight hours and is only for residential use, not for businesses. The only accepted items are glass bottles and jars, aluminum and steel cans, plastics stamped #1 and #2 and plastic containers stamped #3 through #7, flattened cardboard boxes and cartons (including juice and soy milk cartons), junk mail, office paper, phone books, magazines and newspapers including inserts. Bottles, jars, cans and cartons must be rinsed the lids need to be removed. All containers that hold liquid must be emptied. 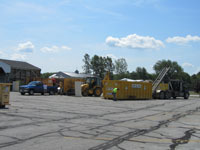 Ottawa, Seneca & Sandusky County (OSS) Joint Solid Waste District also offer recycling. Please click here for their flyer. The brush drop off site is located at 310 S. Bridge Road (SR 269) across the street from the Police Station behind the dog park. It is open from dawn until dusk, typically from April to November. Contractor's are not permitted to use this service. ** Leaf drop-off will be permitted during April and May. You must use Biodegradable bags or bring loose leaves. Please do not leave any other type of leaf bags. Available at the the brush drop off site is free mulch for residents. Residents are welcome to come fill their trucks or trailers on their own. Each spring/summer, a listing of dates that the Service & Maintenance Department crew will be available to assist residents to help load up is provided here. Otherwise, assistance is available by appointment only by contacting the the department at (419) 734-4091. Contractor's are not permitted to use this service. For information on the dates for the Ottawa, Sandusky & Seneca County Solid Waste Districts recycling events at the Ottawa County fairgrounds, please click here for their flyer. Behind Township Hall you will find a full complement of soccer and softball fields, a shelter house with grill, picnic tables, water fountain and playground equipment. These facilities are free to residents and perfect for family reunions, graduations parties or birthday parties. Reservations are on a first come, first serve bases and the date is not officially reserved until a complete reservation form has been turned in. Once a reservation has been made, the party will have the shelter house reserved for them the entire day. We do not reserve more than one event per day. Attendee's are asked to clean up after themselves and wrap up all activities by dusk. There may be instances were baseball, softball or soccer games are scheduled in advance thru the various Danbury Recreation Leagues or School District, but the shelter house would still be available. Enjoy the breathtaking views of Lake Erie and Sandusky Bay from our own waterfront park! A shelter house with grills, restrooms, a quarry pond, scenic woods, lake access, fishing, children's playground, covered footbridge are all available in this park. Starting in July 2018, the Township will begin accepting reservations for Lake Point Park shelter house, but for a fee. It will continue to be open to the public daily unless otherwise posted as reserved. The cost to reserve the shelter house is $300. All reservations must be received by the first of the month of the month prior to the event (i.e. July events, reservations must be made by June 1st). Reservations are on a first come, first serve bases and the date is not officially reserved until a complete reservation form and payment has been turned in. Once a reservation has been made, the party will have the shelter house reserved for them the entire day. We do not reserve more than one event per day. Attendee's are asked to clean up after themselves and wrap up all activities by dusk. The Township Hall Meeting Room is also available to reserve but only for other government entity public hearings/meetings or neighborhood association meetings. Parties, weddings and the like are not permitted for this room. In the event that two organizations are interested in the meeting room on the same day, we will do our best to accommodate one group for a morning meeting and the other for afternoon, unless a specific request has been made for the whole day. To check availability of the Township Hall Meeting Room or either Shelter house, please call Cheryl at (419) 734-6120 or email her at assistant@danburytownship.com. Reservations are on a first come, first serve bases and the date is not officially reserved until a complete reservation form has been turned in. We would ask that you please notify us if your event gets cancelled so we can make the date available to others who may be interested. For more information on any of the parks, try clicking on the name for their website links. Located adjacent to the Keeper's House (Wolcott House) on Bayshore Road. Amenities: Scenic bridge, historic monument, picnic tables. Aggressive and/or unfriendly dogs are prohibited. Your dog must be able to play with other dogs. Dogs younger than 4 months old are not permitted in the off-leash area. Children under the age of 12 are not permitted in the off-leash area. Children aged 13-17 must be accompanied by an adult. Dog handlers must be at least 18 years of age. Enter through the double-gate entry. Unleash your dog in the holding area first, then open the inside gate to the leash-free area. Keep all gates closed except when entering or leaving. Remove pinch or choke collars in the off-leash area. Keep the leash in your hand at all times. Dogs must be closely supervised and within sight and voice control of their handler at all times. No more than 2 dogs per handler are permitted. Never leave your dog unattended. Users of this park do so at their own risk. Owners are responsible for damage or injury inflicted by their dog(s). Danbury Township shall not be liable for any injury or damage caused by any dog in this park. Female dogs in heat are not permitted in the off-leash area. All dogs need to be current on vaccinations and licenses. Proof of current rabies vaccination and license is required upon request of police or animal control officers. Tags may serve as proof. Do not bring a dog with contagious conditions or illnesses to the park. NO food or dog treats in the off-leash area. NO glass containers in the off-leash area. NO smoking in the off-leash area. Owners are required to pick up their dog’s waste and deposit it in the containers provided. Leash up and leave if your dog is having a bad day. Act responsibly! Failure to follow park rules may result in a loss of privileges or you may be ticketed. Located on Bayshore Road just south of Quarry Road. Amenities: Public boat launch ramp, breakwall, fishing, hiking, restrooms, secluded forest area. Click here for a map. Located on State Route 269 north (N. Buck Road) just north of State Route 163 (East Harbor Road). Amenities: Camping, large public beach, nature trails, picnic benches, shelter house, restrooms, swimming, fishing, hiking, biking, sledding, ice skating, cross country skiing. (419) 734-9337 or (419) 734-5857. The East Harbor State Park Public Marina is located approximately one mile north of the main park and offers boat launches, fuel, boat slips, public restrooms and a ship's store (419) 734-2289. Located in the heart of the East, Middle, and West Harbors System of Lakeside-Marblehead, open year round, dawn to dusk. The 150-acre Great Egret Marsh Preserve boasts classic Lake Erie marshland, blanketed each summer with water lotus and teaming with wildlife. The preserve is a haven for waterfowl and wading birds—including great egrets, which can congregate there in abundance.These large, wading birds native to this part of Lake Erie can often be found feeding in the area’s shallow waters. Visitors to the preserve will find opportunities for bird-watching, fishing, hiking, kayaking/canoeing and volunteering. The easy to navigate trail is a 1.2-mile loop with interpretive signage and a portion of the trail is wheelchair accessible. From S.R. 2, take S.R. 269 North exit. After 2.5 miles, turn right onto S.R. 163 (E. Harbor Road). Next light approximately 1/2 mile, turn left onto S.R. 269 North (N. Buck Road). 3/4-mile, turn left onto Buck Road 139A. Go 500 feet and the entrance to the preserve will be on your right. Click here for a map. Located on South Confederate Drive. Accessible via $2.00 toll on the Johnson's Island Causeway. Reached by heading south on Gaydos Drive just off Bayshore Road. The remainder of the island beyond the cemetery is privately owned. Open from dawn till dusk. Located at 9999 E. Bayshore Road approximately one-half mile west of the entrance to the access road for the Johnson's Island Causeway. Built in the 1800's as the home of Benajah and Rachel Wolcott, both of whom were lighthouse keepers. The house is open for tours periodically from May to October, for special events, and during the annual Autumn Lighthouse Festival in October. An interpretive sign and historic marker on the grounds provides a detailed history of this unique "federal style" residence. 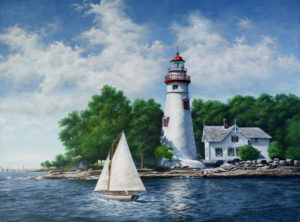 Located at 11257 E. Bayshore Road just south of the Marblehead Lighthouse State Park. Amenities: Picnic tables, shelter house, grills, restrooms, quarry pond, scenic woods, lake access, fishing, children's playground, covered footbridge. Main entrance located just off Erie Beach Road (north of State Route 163). Detailed information on this Chautauqua style resort can be found on www.lakesideohio.com. Gate fees are charged from mid-June until Labor Day. Located on Alexander Pike just south of Main Street (State Route 163) in the Village of Marblehead. This land was donated to the Ohio Department of Natural Resources by LaFarge Corporation. 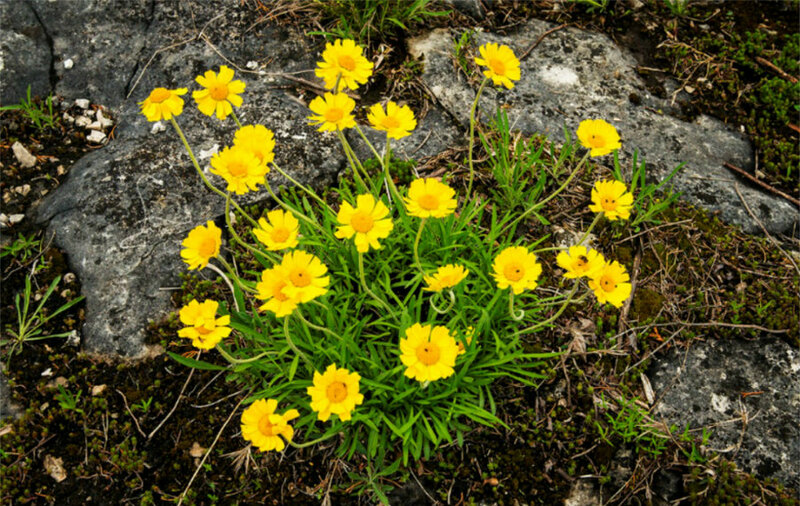 It is the site of the largest concentration of the rare Lakeside Daisy. The park is open only during May while the flower is in bloom. Access during other months is by permit only. Located 110 Lighthouse Drive (off of State Route 163) next to St. Mary's Byzantine Church. Amenities: Picnic tables, park area, shore fishing, restrooms, museum. The oldest continuously working light on the Great Lakes. Built in 1821 and now operated by the State of Ohio. Call East Harbor State Park at (419) 734-4424 for more information. The Lighthouse is open for guided tours beginning the Tuesday after Memorial Day until the Friday before Labor Day from 1 p.m. to 4:45 p.m. Monday through Friday and the second Saturday of the month from June through October from 10 a.m. to 3 p.m. All tours are conducted on a first-come first-served sign-in basis. There is a $2 charge for anyone age 6 and over to climb the lighthouse. The on-site museum is free. Located at 8957 North Shore Boulevard just north of State Route 163 (East Harbor Road). Amenities: Public boat launch, breakwall, fishing, restrooms. Located at 8577 E. Bayshore Road one-half mile west of Dempsey Access. Amenities: Picnic table, park benches, observation deck, paved biking/walking trails, grass and mulched walking trails along the prairie and in the forest. Scenic views of wetland marsh. Click here for a map of the walking trails. In 2000 the Township Trustees made an unprecedented purchase of 33 ares of forest and brook area. Township residents Tim Nash and his late wife, Sylvia, graciously offered this property known as Meadowbrook to the Township at well-below market value. This natural preserve area is home to gulls, heron, geese, ducks, migrating waterfowl, an assortment of water life and wildlife and bald eagles. In December 2001 the Township secured a matching fifty-percent grant from the Ohio Department of Natural Resources to purchase the wetland area of Meadowbrook that is adjacent to the current property. The Department of Natural Resources, The Ottawa County Soil and Water Conservation District and Pheasants Forever extended their full support of this acquisition. The prior Meadowbrook parcel as well as the fifty-percent matches for the wetland area was funded solely with estate tax dollars. 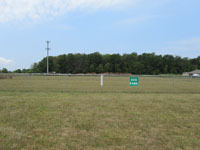 In May 2007 the Trustees were awarded $221,787 from the Ohio Public Works Commission to purchase and additional 46 acres of Meadowbrook property. Danbury Township provided 45% match of $181,462. Once again, this match amount came from estate tax dollars. With the Township's Meadowbrook holdings now reaching nearly 110 acres, a citizen team was gathered to create goals for developing approximately 79 non-wetland acres into a public park. The Trustees hired The Collaborative, Inc. a park-planning consulting firm to assist with this project and to plan hiking and biking trails along with low-density recreational uses accessible to the physically challenged. This project has focused on protection of native plant species and wildlife while allowing the public to enjoy the pristine, natural atmosphere of Meadowbrook Marsh. The Board of Trustees is extremely proud to have made these three acquisitions with no expense whatsoever to the taxpayers. 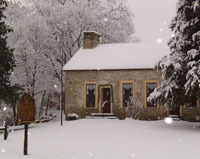 During 2008 the rustees were awarded three additional grants from ODNR for Meadowbrook. 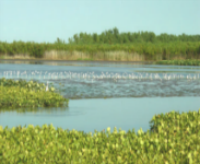 A $50,000 grant from the Office of Coastal Management in conjunction with support by the National Oceanic and Atmospheric Administration was awarded for a 1,121-foot paved multi-use trail and 80-foot long pond-side boardwalk. $40,000 was awarded by Natureworks for a 3-acre land acquisition and an additional $40,000 was awarded by Land and Water Conservation for construction of a 1,676-foot paved multi-use looped trail. Township matches for these three grants vary from twenty-five to slightly more than fifty-percent. Also during 2008 the Ottawa County Community Foundation awarded the trustees a $1,500 grant which was used to purchase park benches and an ADA picnic table. Natureworks also permitted part of their grant funding to encompass paving two ADA accessible parking spaces and a connecting paved ADA trail to meet up with the existing ADA trails. In 2010 the Clean Ohio Trails Fund (COTF) awarded $126,343 for 4,000 additional feet of ADA accessible paved trails in conjunction with a grant from the Recreational Trails Program in the amount of $43,317 to complete the project. The paved trails along with intersecting grass and mulched trails are open to the public year-round from dawn to dusk. The Township does not permit hunting, motorized vehicles or horses in the preserve. Located off Huron Trail (Next to 10011 Huron Trail) approximately one-half mile behind the Keeper's House (Wolcott House). This is the burial site of Benajah Wolcott and others. There is a small sign tucked in a tree line and a gravel lane leading back to the cemetery. The trail is narrow and bears to the right. Parking is available just behind the residential homes and walking back to the cemetery is encouraged due to limited maneuverability at the cemetery location for vehicles. Hours: 7a.m. to 3 p.m.